As a thank you to our one million Facebook fans and counting, we asked you what prize you'd love most... a Galaxy S II, Nexus, or Tab. Your responses were so overwhelming that we've decided to give away not one but ten of each. Enter now! The giveaway lasts 2 days and ends at 8:59 a.m. on January 15th, so you won't have to wait too long for the results. Below are the terms if you're into reading the fine print (which you should). The "official rules" link actually has some of the information wrong (50 vouchers vs 100 and no mention of the SGS II at all), but we know first-hand how tedious creating all the terms is, so we'll let it slide as long as they give out everything in the above picture. No purchase necessary. Void where prohibited. 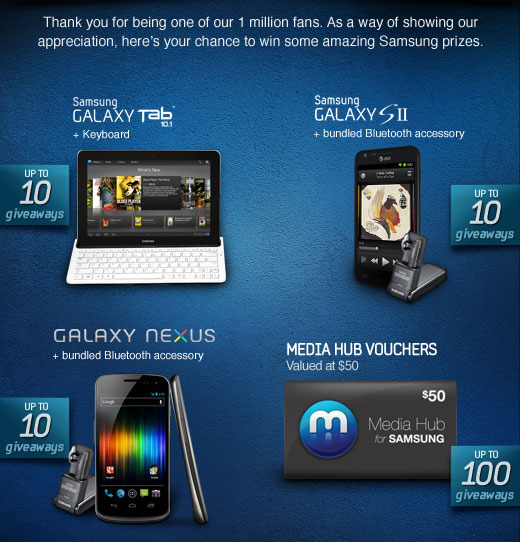 Samsung Mobile USA Facebook 1 Million Fans Sweepstakes is sponsored by Samsung Telecommunications America. Open to legal residents of the 50 U.S. & D.C., 18 or older. Begins 9:00 am ET on Friday, January 13, 2012 & ends 8:59 am ET on Sunday, January 15, 2012. For official rules, visit the Official Rules.